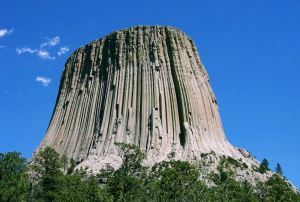 The Devils Tower is a volcanic plug located in the Wyoming portion of the Black Hills just west of Hwy 24. Indisputably the most famous butte in the United States, if not anywhere in the world - only the landscape of the Monument Valley/Four Corners area rivals Devils Tower in the public imagination. Not anywhere near the highest thing in the Black Hills, and quickly surpassed by the higher Missouri Buttes just to the northwest. The small service-town at its foot is named unsurprisingly "Devils Tower". All summit routes involve rock climbing, the easiest being Class 5.6.